Discussion in 'Request Area' started by Redemption, Jul 20, 2010. This is my first post here on TF2maps.net. I used to go on this site for months and when I heard about the new contest, I just had to join this site. I am working on a harvest themed map for the new contest, and I would like to have some simple models for it. What I need is: cabbage,apple,carrots and pears. I would be glad if guys could help me! Thanks. edit: - I removed the corn and added apples and pears. In what pose do you need them? In the ground? On a table? Should we model the field rows of dirt as well? Be more specific. Oh , I am sorry. thank you. - and I will post some screenshots of the map soon! I agree, eyefork is so kind for helping people like us out! Okay my computer is going crazy so I'm not sure that I can complete this. Really sorry! what a shame :/ but thank you for your try, I really appreciate it! Is anyone else interested in doing one of those things? It would be a very big favor! I'm gonna attempt a cabbage sometime, hopefully it can be used for something without carrots, apples and pears. i've run into a bit of a wall with my steamroller model. I'd be interested in plugging away on a few of these fruit and vegetables. How many carrots on the table y'figure? If you have three carrots, for example, placed here and there on the table - they'd all be the same size and shape. it'd look awkward. variation would be key if you have multiples of ANYTHING. In the background or will players be walking amongst them? 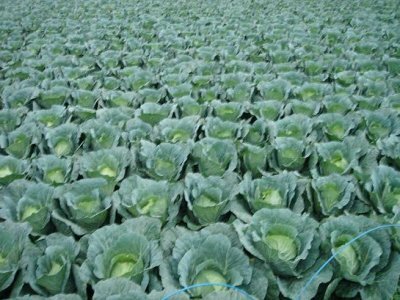 This I perceive as a challenge because ONE cabbage won't do if you have them in rows. They'll all be identical and will just look really wierd. As a mapper you'd have to place each on individually and then rotate the model ... you wouldn't have any control over scale so it would likely look quite artificial. In this case, you'd probably want to have a bunch of different variations - like 4-8. Different scales and rotations and leaf deformations. The burden of placing all of those static meshes and rotating them to make them look natural would probably be half a days work for you. An alternative to that would be to provide the modeler the dimensions of the plot of land they'll be in. They would model in all the variations in their application and provide you with a single static mesh object you'd place once and maybe rotate a bit to suit your needs. Then consider the mapping communities needs. How often does someone need a huge cabbage patch? Would the odds of someone needing a hobby patch be greater than someone needing a patch that could feed a town? You haven't posted any overall concepts of your map so these are all questions I'd be grilling you with in the boardroom if there was one. In a fruitbowl on a breakfast table? Or just lying about on the floor? I think you really need to post your concepts pronto. Otherwise none of this can get off the ground. If you can't sketch, then block things out in hammer, color code stuff and label it in photoshop. go, go go. Here are some screens of the map. In the scond screenshot you can see a small area (maybe a garden) where the cabbage is supposed to be. The lighting and the details aren't done yet. Oh and I want the apples and pears to lay on the ground , So they shouldn't look clean.